Abstract. 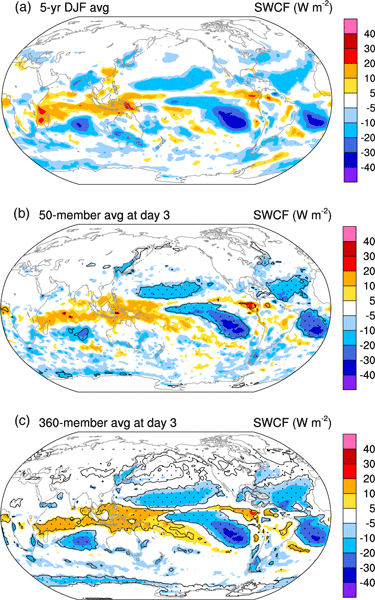 This paper explores the feasibility of an experimentation strategy for investigating sensitivities in fast components of atmospheric general circulation models. The basic idea is to replace the traditional serial-in-time long-term climate integrations by representative ensembles of shorter simulations. The key advantage of the proposed method lies in its efficiency: since fewer days of simulation are needed, the computational cost is less, and because individual realizations are independent and can be integrated simultaneously, the new dimension of parallelism can dramatically reduce the turnaround time in benchmark tests, sensitivities studies, and model tuning exercises. The strategy is not appropriate for exploring sensitivity of all model features, but it is very effective in many situations. Two examples are presented using the Community Atmosphere Model, version 5. In the first example, the method is used to characterize sensitivities of the simulated clouds to time-step length. Results show that 3-day ensembles of 20 to 50 members are sufficient to reproduce the main signals revealed by traditional 5-year simulations. A nudging technique is applied to an additional set of simulations to help understand the contribution of physics–dynamics interaction to the detected time-step sensitivity. In the second example, multiple empirical parameters related to cloud microphysics and aerosol life cycle are perturbed simultaneously in order to find out which parameters have the largest impact on the simulated global mean top-of-atmosphere radiation balance. It turns out that 12-member ensembles of 10-day simulations are able to reveal the same sensitivities as seen in 4-year simulations performed in a previous study. In both cases, the ensemble method reduces the total computational time by a factor of about 15, and the turnaround time by a factor of several hundred. The efficiency of the method makes it particularly useful for the development of high-resolution, costly, and complex climate models. 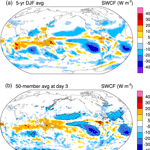 How to cite: Wan, H., Rasch, P. J., Zhang, K., Qian, Y., Yan, H., and Zhao, C.: Short ensembles: an efficient method for discerning climate-relevant sensitivities in atmospheric general circulation models, Geosci. Model Dev., 7, 1961-1977, https://doi.org/10.5194/gmd-7-1961-2014, 2014.